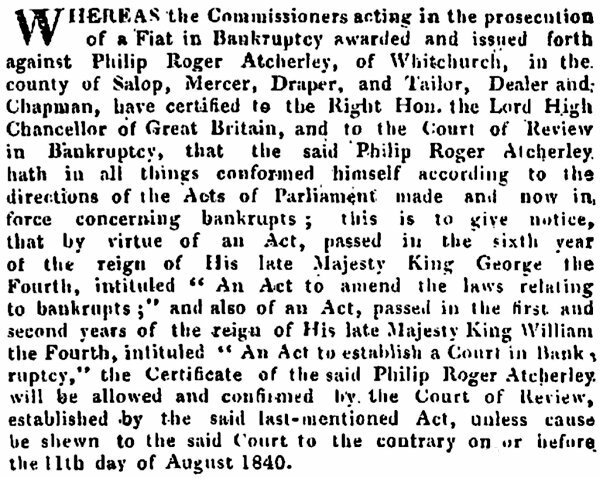 WHEREAS a Fiat in Bankruptcy is awarded and issued forth against Philip Roger Atcherley, of Whitchurch, in the county of Salop, Mercer, Draper, and Tailor, Dealer and Chapman, and he being declared a bankrupt is hereby required to surrender himself to the Commissioners in the said Fiat named, or the major part of them, on the 14th day of January next, and on the 8th day of February following, at eleven o’clock in the forenoon on each of the said days, at the Shire-hall, in Shrewsbury, in the said county of Salop, and make a full discovery and disclosure of his estate and effects […] – London Gazette, 28 December 1838. It may seem premature to mention the gravestone of Philip Roger Atcherley [ ] at this point in his story, but I do so only to observe the date and place of birth recorded on it: 29 August 1814, in Whitchurch. I suspect however that Philip’s birth actually took place one year later, as he was baptised at St Alkmund’s in Whitchurch on 19 September 1815. The register notes that the family home was in Pepper Alley, and that Philip’s father John Atcherley [ ] was a victualler (another copy of the register used the term “inn keeper”). Philip was the sixth and last child, and the fourth son, of John and his wife Martha Atcherley, née Furmston [ ]. Although no forename was given for young ‘Atcherly’, I believe he could only have been Philip. Was he also employed by Moile and Roscoe? Or was he simply visiting his friend Lewis (who was most likely living in the shop where he worked), and persuaded by Lewis to throw the stone? Whatever the case, within a couple of years of this incident Philip Roger Atcherley was married and working in a shop of his own. He wed Mary Phillips [ ] of Whitchurch on 18 January 1836, and when the couple’s first daughter – Anna [ ] – was baptised on 7 June 1837, Philip was described as a mercer. Mary Phillips was a widow. Many years later her gravestone would also say that she was born at Whitchurch (on 19 August 1812), but I can find no record of a baptism to corroborate this. The story of Mary’s life before her marriage to Philip Atcherley is short but somewhat complicated. Mary’s surname at birth was Howell. 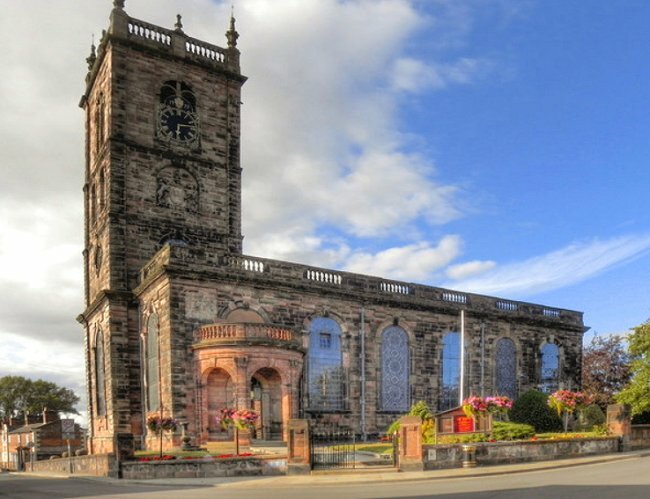 On 30 December 1834, at the church of St James in Walton on the Hill in Liverpool, Lancashire, “William Philip Phillips of the Parish of Whitchurch in the County of Salop Widower and Mary Howell of this Parish Spinster” were married by licence. The witnesses who signed the register were John Howell and James Howell. So far, so good. William Philip Phillips [ ] was a widower. On 11 January 1832, “William Philip Phillips of this Parish and Maria Davies of this Parish” were married by licence at Whitchurch, Shropshire. The couple’s union was soon blessed with the arrival of a child. Mary Ann Phillips [ ] was baptised at Whitchurch on 20 March 1833, the record of that event showing that the Phillips family lived at High Street, and that William was an upholsterer. Sadly for William, his happiness was soon overturned by events which would (if you will forgive my use of this phrase) knock the stuffing out of anyone. Not long after the birth of daughter Mary Ann, William’s wife Maria Phillips (née Davies) [ ] died, aged 24. She was buried at Whitchurch on 5 April 1833. Within a year, little Mary Ann had died too. She was buried on 18 January 1834. As we know, the ill-fated William Philip Phillips then married Mary Howell later that same year, entering into a union which would end all too soon through William’s own death. This event occurred less than five months after his wedding: William, aged 28, was buried at Whitchurch on 23 May 1835. Whitchurch St Alkmund – scene of most of the baptisms, marriages and burials in this story. THE WIDOW and FRIENDS of the late Mr. William Philip Phillips, of WHITCHURCH, Auctioneer and Upholsterer, deceased, deeply impressed with Gratitude for the Support which was so liberally bestowed upon him, beg sincerely to return Thanks to those who kindly honoured him with their Commands. And so we return to the wedding of Philip Roger Atcherley and Mary Phillips in 1836 and the birth of their daughter Anna in 1837, when this young family’s prospects for the future must have seemed bright. Phillip was in business as a mercer and draper at Whitchurch in Shropshire and at Nantwich in neighbouring Cheshire, in partnership with one Robert Evans. This partnership was dissolved on 4 January 1838 by mutual consent, with all debts due to and owing by the said partnership to be “received and paid by the said Philip Roger Atcherley”. Was it the dissolution of this partnership, and Philip’s responsibility for the debts owed by it, which led to his bankruptcy later in 1838? Or was there another factor? An event which took place during the previous year may in fact have been the foundation of Philip’s financial failure: the death of his father John in January 1837. After the official notice of Philip’s bankruptcy was published in the London Gazette of 28 December 1838 (the first part of which forms the opening paragraph of this story), this news was widely disseminated via the press across Britain. The circulation of the details of bankrupts in this way was standard practice. Most of the bankruptcy listings gave only brief details of the names, locations and businesses of those involved, culled from the Gazette. In Philip’s case though, some included an additional a piece of information: the ‘Petitioning Creditor’ was Martha Atcherley. I think Philip must have borrowed a large amount from his father, and that after John’s decease the widowed Martha Atcherley sought to recover what was owed. Philip was clearly not in a position to repay his debt, leaving Martha with no alternative but to seek a fiat in bankruptcy against her son. DRAPER’S STOCK-IN-TRADE, HOUSEHOLD FURNITURE, &c and all other goods and effects of Philip Roger Atcherley, mercer and draper, a bankrupt. All the well assorted and carefully selected Stock-in-trade of the said bankrupt, as a Woollen and Linen Draper, Hosier, Haberdasher, Hatter, &c.
This will be found well worth the attention of the trade, as the whole of the stock is of the latest patterns, &c. has been purchased from the first manufacturers and is peculiarly adapted to the Stock of a Draper, &c. in a country district. Further meetings of the Commissioners in the fiat of bankruptcy against Philip Roger Atcherley followed, the notices of which typically described Philip as a “Mercer, Draper, and Tailor, Dealer and Chapman”. The first, on 30 May 1839, was held “to Audit the Accounts of the Assignees of the estate and effects of the said bankrupt” and “to make a Dividend of the estate and effects of the said bankrupt”. The next, “to Audit the Accounts of one of the Assignees of the estate and effects of the said bankrupt” and to make a further dividend of Philip’s estate and effects, took place on 20 November 1839. It appears that someone did show “cause to the contrary” in Philip’s case, and that the issue of his certificate was stayed. I have found nothing relating to Philip and his bankruptcy in the London Gazette or in the newspapers from August 1840 to the end of 1842, but the Gazette of 3 February 1843 carried a notice of yet another meeting to audit the accounts of Philip’s assignees and make a dividend to his creditors. A further such meeting took place on 2 August 1844. Then, in October that year, almost five years after Philip was declared bankrupt, it was announced that his creditors could “receive their warrants for the Second Dividend of 1¾d. in the pound”. Did Philip ever receive his certificate from the Commissioners? I don’t know. What I do know is that by the middle of 1850, Philip Roger Atcherley and his family had left his bankruptcy worries behind and made a fresh start – in the United States of America. > On to Philip Roger Atcherley: A Brit bounces back in the USA – Part 1. Picture credits. 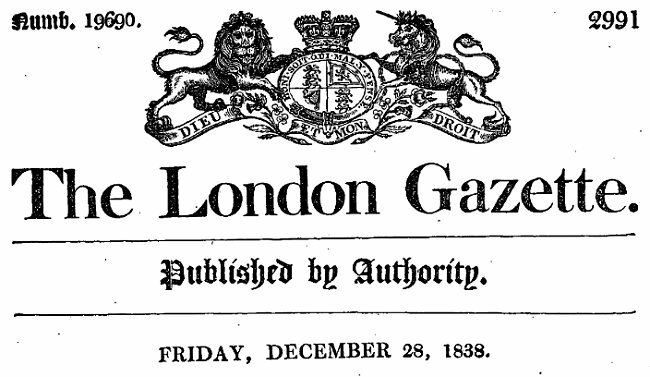 Masthead of the London Gazette, issue 19690, 28 Dec 1838: Image used under the Open Government Licence v2.0. Whitchurch St Alkmund, Shropshire: Photo © Copyright David Dixon, taken from Geograph and adapted, used and made available for re-use under a Creative Commons licence. Extract from London Gazette, issue 19876, 21 Jul 1840, page 1718: used under the Open Government Licence v2.0. London Gazette, issue 19690, 28 Dec 1838, page 3004. Philip R. Atcherley. At: Find A Grave (website, accessed 2 Dec 2017). Whitchurch, Shropshire, baptism registers covering 1815. Entries in both dated 19 September 1815 for Philip Roger, parents John and Martha Atcherley. Copies viewed at Shropshire Archives and at Findmypast – Shropshire Baptisms. Indexed by FamilySearch, Batch I02497-1, Film 1702220, Ref ID item 2 p 60. Hereford Times, 29 Mar 1834, page 4. Whitchurch, Shropshire, marriage register covering 1836. Entry dated 18 Jan 1836 for Philip Roger Atcherley and Mary Phillips. Copies viewed at Shropshire Archives and at Findmypast – Shropshire Marriages. Whitchurch, Shropshire, baptism register covering 1837. Entry dated 7 Jun 1837 showing: Anna dr of | Philip Roger & Mary | Atcherley | High St. | Mercer. Copies viewed at Shropshire Archives and at Findmypast – Shropshire Baptisms. Mary Howell Atcherley. At: Find A Grave (website, accessed 3 Dec 2017). Walton on the Hill (St James), Liverpool, Lancashire, marriage register covering 1834. Entry dated 30 Dec 1834 for William Philip Phillips and Mary Howell. Copy viewed at Ancestry – Liverpool, Lancashire, England, Marriages and Banns, 1813-1921 (Date transcribed as 13 Dec 1834). Whitchurch, Shropshire, marriage register covering 1832. Entry dated 11 Jan 1832 for William Philip Phillips and Maria Davies. Copy viewed at Findmypast – Shropshire Marriages. Whitchurch, Shropshire, baptism register covering 1833. Entry dated 20 Mar 1833 showing: Mary Ann daur of | William & Maria | Phillips | High Street | Upholsterer. Copy viewed at Findmypast – Shropshire Baptisms. Whitchurch, Shropshire, burial register covering 1833. Entry dated 5 Apr 1833 showing: Maria Phillips | High Street | 24. Copy viewed at Findmypast – Shropshire Burials. Whitchurch, Shropshire, burial register covering 1834. Entry dated 18 Jan 1834 showing: Mary Ann Maria Phillips | Bark Hill | Months 11. Copy viewed at Findmypast – Shropshire Burials. Whitchurch, Shropshire, burial register covering 1835. Entry dated 23 May 1835 showing: William Philip Phillips | Dodington | 28. Copy viewed at Shropshire Archives. Salopian Journal, 10 Jun 1835, page 3. Copy viewed at Findmypast. London Gazette, issue 19576, 5 January 1838, page 42. Caledonian Mercury, 31 Dec 1838, page 1. “FROM THE LONDON GAZETTE.” Copy viewed at British Newspaper Archive. Dublin Morning Register, 4 Jan 1839, page 1. “ENGLISH BANKRUPTS.” Copy viewed at British Newspaper Archive. Newcastle Journal, 5 Jan 1839, page 4. “FROM FRIDAY’S GAZETTE, Dec. 28” Copy viewed at British Newspaper Archive. Hereford Times, 5 Jan 1839, page 4. “FRIDAY’S GAZETTE” Copy viewed at British Newspaper Archive. Robert Henley Eden (1832), A Digest of the Bankrupt Law. Page 396. Copy viewed at Google Books. Chester Chronicle, 15 Feb 1839, page 3. Copy viewed at Findmypast. Chester Chronicle, 8 Mar 1839, page 2. “Bankrupt’s Drapery Stock.” Copy viewed at Findmypast. London Gazette, issue 19730, 3 May 1839, page 944. London Gazette, issue 19781, 22 Oct 1839, page 1980. London Gazette, issue 19781, 22 Oct 1839, page 1984. London Gazette, issue 19876, 21 Jul 1840, page 1718. London Gazette, issue 20193, 3 Feb 1843, page 402. London Gazette, issue 20361, 9 Jul 1844, page 2370. London Gazette, issue 20396, 22 Oct 1844, page 3614. 1850 United States census. State: New York. County: Oneida. Place: Rome. Page: 60 (verso).